Order one for each DE office and location to be fully compliant. 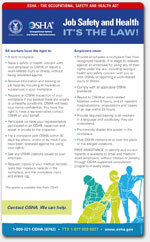 The OSHA poster is included on the Delaware Complete Labor Law Poster. When you order the Delaware Complete Labor Law Poster, it will satisfy your State, Federal, and OSHA posting requirements with one poster. 09/2018 - Minimum Wage Poster - Revised to include new 2019 minimum wages. 09/2018 - Discrimination - Discrimination notice revised to include new information about Sexual Harassment, rights for disabled individuals, and rights for pregnant women. 11/2014 - Discrimination Notice Poster - Updated to include new pregnancy accommodation laws, effective 1/1/2015. 05/2014 - Minimum Wage Poster - Updated to reflect new 2014 minimum wage rate of $7.75 per hour, effective 06-01-14 and new 2015 minimum wage rate of $8.25 per hour effective 06-01-15. 06/2009 - Minimum Wage Poster - Content has been updated including Dept. of Labor contact information. 01/2017 - Discrimination - Update includes new protection rights for volunteer first responders, victims of domestic abuse and more. 10/2016 - Discrimination - Update to Discrimination poster, change was an increase in number of days within to file complaint after alleged incident. 08/2009 - Child Labor Law Poster - Content has been updated including Dept. of Labor contact information. 08/2009 - Break Rules Poster - Content has been updated including Dept. of Labor contact information. 08/2009 - Discrimination Notice Poster - Content has been updated including Dept. of Labor contact information. 08/2009 - Workers' Compensation - Content has been updated including Dept. of Labor contact information. 08/2009 - Payment of Wages Poster - Content has been updated including Dept. of Labor contact information. 08/2009 - Minimum Wage Poster - Content has been updated including Dept. of Labor contact information. Many industries such as the restaurant, retail, construction, and professional use the Delaware Complete Labor Law Poster to satisfy their compliance requirements for State, Federal, and OSHA. When posted in an area frequented by employees, the Delaware Complete Labor Law Poster puts a business in full compliance. Federal contractors and subcontractors are required to display more postings in addition to the general State, Federal, and OSHA regulations. Please click here to see the federal contractor and subcontractor posting requirements. Ensure your full compliance by posting the Delaware Complete Labor Law Posters with the federal contractor-required postings.